Fresh academic research into the 38 stones and fragments strongly suggests that St Vigeans was once home to an important royal monastry. It may also have been a significant pilgrimage centre, perhaps due to the presence of relics of the Irish St Fechin, from whom the village took its name. Back in the 9th century Arbroath was a small port serving the needs of the more important settlement at St Vigeans. The large stone crosses would originally have been set up as monuments, boundary markers and gravestones on the church hill at St Vigeans. There can be few more charming "kirktons" than that of St Vigeans. The historic church sits on a smooth green mound skirted by a curve of attractively restored traditional cottages and bridges over the Brothock which flows through the tree-sheltered valley to the town of Arbroath and the sea some one-and-a-half miles away. The conical mound about 40 feet high on which the church is built is one of a succession of natural kaims or low ridges in the Brothock Valley, all with the longer axis running north and south. The level space at the top which is 80 feet from west to east, and 130 feet from north to south, has largely determined the size of the church. Excavations at St Vigeans and at various sites close by have shown numerous traces of very early inhabitants in the form of bronze weapons, ornaments and carved stones. 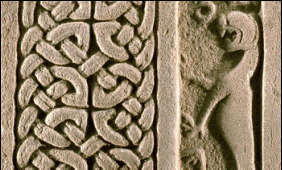 In particular, the carved stones found on or near the mound of St Vigeans and housed in the village museum are of some distinction. There is nothing to date the arrival of Christianity at St Vigeans. It may have come with one of the missionaries from Ireland and Iona who moved over Scotland in the 6th and 7th centuries, establishing churches where they made converts. This probability is supported by the name St Vigeans, which comes from the Latin name (Vigianus) for St Fechin of Ireland who died in 664. His festival (20th January) was celebrated in the area as St Vigians Market until the early 18th century. St Vigian is not known to have visited the area himself and the name may have been given by one of his followers. 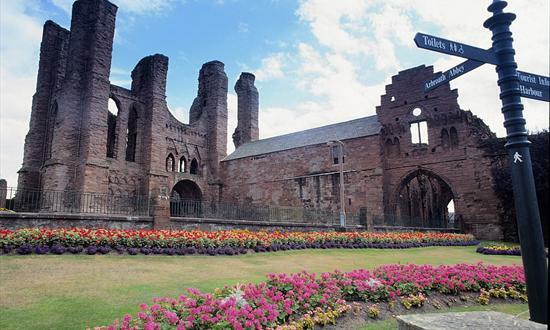 The name was certainly associated with the church when William the Lion founded the Abbey of Arbroath in 1178 and gave the church and all its belongings to the Abbey. There are, however, no remains of a building earlier than parts of the 12th century church. The church was consecrated in 1242 by Bishop David de Bernhame of St Andrews, to whose diocese it belonged. This act was probably only to ensure the proper consecration of an existing building by then of some importance because of increased population brought about by the building of the Abbey. The church had little subsequent alteration, beyond the addition of the tower, until about 1485. It was again dedicated along with two altars, one to St Sebastian, the other probably to St Vigian, and a graveyard. During the whole period from 1178 to the Reformation in 1560, the church was a cure or dependency of the Abbey which supplied a priest (originally a secular appointment but later a monk) for the daily services. St Vigeans remained during that period the parish church for the town of Arbroath whose inhabitants heard Mass there rather than in the Abbey, which was a closed community. The church suffered little change at the Reformation, apart from the removal of the altar and the placing of a pulpit in a central position to meet the needs of the Presbyterian form of worship. There was a short period of Episcopal worship at the Restoration (1660) under the Rev Patrick Strachan whose son George, also an Episcopalian, attempted to succeed him but was rejected by the Presbytery. A west loft or gallery was probably built about this time. Kirk Session records (which begin in 1665) refer often to the need for repairs to the church, which reached a crisis in 1720 when major repairs to walls were required. Towards the end of that century the roof was replaced, an east loft or gallery was built and the belfry was repaired. In 1827 a second north aisle was built to meet the needs of the expanding population of the parish and repairs were made to the roof. The ineffectual repairs of the 18th and 19th centuries made a major restoration necessary in 1871/72 to preserve the church. This was capably done by R Rowand Anderson (later knighted) of Edinburgh who was then at the outset of a distinguished career as an architect. Various additions of the 17th, 18th and early 19th centuries were removed, roofs replaced, a new second north aisle and the apse (or apsidal chancel) added at a cost of £3000, of which £1600 was assessed on the heritors or landowners, who were then responsible for the fabric of the parish church, and the balance came from donations. The restored church was re-opened on 9th May 1872 and has remained virtually unaltered since then. Despite the activity of the restoration, time was found around that period by the minister, the Rev Dr William Duke, to encourage the establishment of separate churches at Auchmithie and Colliston (each some four miles away) to serve these parts of the parish. The charge of Aucmithie was re-united with that of St Vigeans in 1953. The earliest church of which any part remains was probably built in the first half of the 12th century. It measured 60 feet from east to west, which was the length prescribed by St Patrick for a first class church, and some 27 feet from north to south, the walls being three feet thick and spanned by one roof. The east and west gables of the present first north aisle (see plan) are of the squared Norman masonry of that time although the west gable has been largely refaced. The north wall of that church ran between the present first and second north aisles and the south wall ran along the centre of the present nave. In the early 13th century the south wall was rebuilt on a line now marked by the pillars of the south aisle, and the present arcade (line of arches) of the first north aisle was built with pillars which look Norman, but are of a style used in Scotland for some centuries after that period. The original east and west gables were heightened and extended at the same time. The church then occupied the area of the present church but without the south aisle, second north aisle and apse. This was the church consecrated by Bishop de Bernhame in 1242. The lower two storeys of the present tower were probably built on to the west end of the church soon after that date. Shortly before the re-dedication in 1485 the south wall was taken down and replaced by the present arcade and the south aisle built over the graveyard (see plan). The new arcade is of octagonal pillars rather than the round pillars of the north arcade, the stone is from a different quarry, and the capitals of the pillars are rather more decorative. There are eight clerestorey windows above this arcade but only three above the north arcade, the date of these windows being uncertain. At this time the tower was also partly rebuilt and heightened with a parapet at the top and a saddleback roof, the ground floor of the tower was given a vaulted roof and, probably also at this time, an entrance to the church itself was formed through the old gable on the east of the tower. Doors in the north and south aisles were possibly at the same positions as now but there were very few windows, none at all in the north aisle, and most of the light came from the clerestorey windows. The various additions and alterations made in the 18th and 19th centuries which are earlier referred to were all removed in the restoration of 1871/72 and have no architectural significance. Sir R Rowand Anderson's plans for the restoration provided for the removal of the lofts with their outside stairs and the second north aisle of 1827, the latter being replaced with a new aisle of more convenient form and more in harmony with the architecture of the church. All the old portions of the fabric were carefully preserved and their features restored. The walls of the tower were again heightened to form an adequate belfry, the parapet and saddleback roof were replaced, and a new stair turret was built on at the south-east corner. The apse was built out at the east end of the nave with a vestry and heating chamber underneath, making use of the fall in ground level. The 18th century roofs of the nave and aisles were removed and new roofs following the lines of the roofs of 1485 were erected, the horizontal ceiling of the nave being replaced by an open timber roof. Twelve crosses would have been cut in the masonry at various places when the chancel was first consecrated in 1242. Of these, seven are still on the walls, five in their original positions and the most easily observed are marked on the plan. The design of a consecration cross is worked on the pulpit fall. The triple seat with elaborately curved moulding under the centre window is known as a sedilla and dates from the building of the apse, but in a pre-Reformation church would have been occupied by the clergy conducting a service. The carved wooden stalls also date from 1872. The communion table was refurbished in 1964 when the wrought iron lectern was made, and embroidery for the communion table, pulpit and lectern falls with sets of bookmarks for the different seasons of the Christian calendar was worked by members of the congregation. The seats behind the communion table were presented in 1968 in memory of the Rev Charles E Duff, minister from 1912 to 1958. The glass of the apse was installed soon after it was built in 1871/72 and represents the Nativity, the Baptism, the Crucifixion, the Resurrection and the Ascension of Christ. It is all of German (Munich) manufacture which was fashionable at that time and the windows were presented as family memorials as indicated by the inscription of the first window and the brass plates below the others. The window at the east end of the south aisle showing the martyrdom of St Stephen is of the same period but was made in Leith. The glass of the "David and Goliath" window in the second north aisle was also made in Germany. The "Abide with Me" window in the same aisle is a memorial of the Donaldson family, of which a father and son were Kirk Treasurers for a total of 53 years. The "Centurion" window near the centre of the south aisle was made by Gordon Webster of Glasgow and was gifted in 1976 in memory of the Kydd Smith family. In the apse there are brass memorial plates to former ministers and others as mentioned earlier, and haut relief inscriptions in memory of Mrs Rickard of Woodlands, whose gift financed that part of the rebuilding in 1871, and of the Rev Dr William Duke, minister of St Vigeans from 1865 to 1911, who inspired the restoration of 1871/72. The monument on the east wall of the first north aisle was erected in 1872 to the memory of the Rev John Muir, minister of St Vigeans from 1816 to 1865, and is an interesting piece of Gothic architecture designed by Sir R Rowand Anderson in variegated alabaster and black French marble surrounded by a freestone moulding. A tablet in memory of the Muir family was added beneath it later. These memorials face one carved in white marble on the west wall of the north aisle to Dr John Henderson of the Indian Medical Service who died at Lodiana in the Punjab in 1836, and was a son of a local proprietor. On the east wall of the south aisle are memorials to relatives of the Rev Dr William Duke. The most historic monuments in the church are those on the north wall of the second north aisle. One in black marble is to Sir Peter Young of Seaton (an estate north of Arbroath) who was joint tutor with George Buchanan to King James VI and was, as the Latin inscription says, "dearly loved by his King at home, by the citizens and by foreigners." A white marble 18th century monument in the same aisle commemorates John Demspter of Dunnichen, near Forfar, who owned part of the estate of Letham Grange in St Vigeans Parish and whose more famous son, George Dempster, was regarded as honest and kind-hearted, and described by Robert Burns as a "true blue Scot", but who was nevertheless fined £30,000 for bribery and corruption in his election to Parliament. At the north end of the apse arch is the octagonal Baptismal Font, which is believed to have been the Holy Water Font of the medieval church. It was subsequently built into the north aisle wall then used to form the base of a cross at the top of the tower, and finally in 1872, after much needed resurfacing and restoration, it was returned to its previous use. The two manual organ built by Messrs Harrison of Durham was installed at a cost of £395 in 1875, an unusually early date for a country church in Scotland. The belfry rebuilt over the earlier tower in 1871/72 contained only the single heritors' bell which was used to call the congregation to worship, until a ring of five tubular bells made in Coventry and gifted by Mr A Weir of Kinimonth, Perthshire was installed in 1902. Above the south aisle door is a sundial dating from the 1872 restoration with the motto "my days are like a shadow that declineth" which was suggested by Dr Alexander Brown, a noted meteorologist who came from nearby Grange of Conon. The sundial is of a type known as a declining dial (determined by the orientation of the church) and has inscribed on it the Greek monogram for Christ. The translation that resulted in the production of the King James Bible started in 1604 and was not completed until 1611. In 2011, we celebrated the 400th anniversary of its completion. Sir Peter was born in Dundee on 15th August 1544 and died at East Seaton aged 84 years on 7th January 1628. He was knighted in 1605. He was married 3 times and had 16 children (8 sons and 8 daughters) the last born in 1608 when he would have been 64. His eldest son was named James, “at the King’s special request.” James later received a knighthood and several other children grew up to occupy important positions in society. Sir Peter purchased East Seaton around the year 1580/81 and shortly after that he acquired Dickmontlaw. A number of place names that are familiar to us are found in documents relating to Sir Peter – for example Aldbar and Arbikie. It is clear that the influence Sir Peter’s diligence, faith and integrity had on the King was highly significant. After reading details of Sir Peter Young’s life, one is inclined to wonder that if it were not for his considerable influence would King James have commissioned the authorised version of the bible.